While Avon, Indianapolis, and Plainfield drivers are all looking for something a little bit different in their next car, we here at Andy Mohr Toyota know that at least one of their priorities will be the same. All drivers want a car that can protect them. So, we’ve put together this list of articles to show you how Toyota models, with their consistently high safety ratings, can do just that. There’s only one way to know if a car can keep you safe when push comes to shove, and that’s to place it in a high-stress collision scenario. Luckily, the National Highway Traffic Safety Administration (NHTSA) and Insurance Institute for Highway Safety (IIHS) have done just that. Through rigorous crash testing, both the NHTSA and the IIHS have repeatedly determined that Toyota safety holds up, even in a number of different driving situations. In our Toyota safety ratings pages, we’ll break down how each specific model manages to nab commendations from the NHTSA and IIHS. They all bring something different to the table, but you’ll notice many similarities in their safety arrays. Toyota employs many different safety features in all their vehicles, including a rigid structure. High-tensile strength body parts and energy-absorbing reinforcements mean that Toyota cars can rebuff some of the worst collision forces. In addition to these features, you’ll also find some smart technology in each model. The Star Safety System™ employs several systems, such as Enhanced Vehicle Stability Control and Traction Control, to improve your handling—even when you’re driving on hazardous roads. 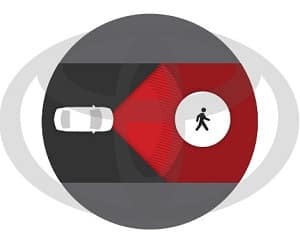 Toyota Safety Sense™ P is an intuitive safety suite that uses sensors and small cameras to monitor and react to the road around you. In some cases, it can even act autonomously to prevent accidents from happening. Some of the features that help the Toyota brand earn such high safety ratings are quite cutting-edge. To understand what they’re capable of, Avon, Indianapolis, and Plainfield drivers should experience them firsthand. Contact Andy Mohr Toyota to schedule a test drive today.